Summary: After 18 years in prison, Viktor Khadem (Don Hany – East West 101, Offspring, Serangoon Road, Broken Shore) is a man who has almost given up on life. Near the end of his sentence he is sent to Won Wron, a low-security prison farm 200 km outside Melbourne in regional Victoria, where Senior Case Worker Matt Perry (Hugo Weaving) has established a unique program to rehabilitate broken men through giving them the responsibility for the rehabilitation of injured raptors – beautiful, fearsome proud eagles, falcons and owls. Against all odds, Matt takes on Viktor as his number one test case, introducing him to Yasmine, the majestic Wedge-tailed Eagle with a two metre wingspan. If these two can tame each other, anything is possible. Over the past few years the prison genre of both the small screen and the big screen has become a reason for screenwriters to portray the art of brutality. Bashings, stabbings even the odd prison gets thrown in as Hollywood expects the audience to believe that most prisons are an absolute war zone. It’s therefore a bit of a relief to sit down and watch Healing, a film that is more about the rehabilitation and emotions of prisoners rather than the physical violence that goes along with prison life. The central character of Healing is Viktor Khadem (Don Hany – TV’S Devil’s Playground & Serangoon Road), a fifty-something prisoner who has just been placed in the low security prison, Won Wron, as a way to prepare himself for release after serving eighteen years in Pentridge for murder. Here he finds himself befriending the lonely and quite, Paul (Xavier Samuel – Plush, Drift) – a prisoner who doesn’t like to talk about why he is in prison and certainly doesn’t want to see his family. On his arrival at Won Wron one of the guards, Matt Perry (Hugo Weaving – The Mule, The Turning) realises that Viktor needs to seriously change before he is released but can’t find the right rehabilitation program for him. After seeing Viktor’s reaction to finding an injured wedge-tailed eagle he manages to talk the prison hierarchy into allowing him to set up a program headed up by Viktor which would see a select number of prisoners get to work closely with Healesville Sanctuary looking after injured birds of prey. The program begins running and seems to have a positive effect on Viktor, however its whole existence seems to rest on the behaviour of Shane (Mark Leonard Winter – The Boy Castaways, Green Eyed), a prisoner whose limited mental capacity makes him seek out approval from those around him, sadly for the others that normally means he is loyal to the prison’s ‘king-pin’ Warren (Anthony Hayes – The Broken Shore, TV’S Secrets & Lies). The first thing that hits you about Healing is the cinematography. Filmed by Oscar-winning cinematographer Andrew Lesnie, who most would know from his work on The Lord Of The Rings trilogy, the film conjures up some beautiful shots of the wildlife at hand while also capturing some bird-eye views of the Victorian countryside that is rarely seen on the big screen. The visual brilliance of the film is well matched by an emotional script that really captures the thoughts and mind set of prisoners who have to face the reality of once again embarking on the big wide world. Healing does have its faults though. There is the editing which sadly lets down the spectacular visuals. The cuts are noticeable (which should never happen in feature film) and at times makes you feel like you are watching something like Neighbours or Home & Away. The fact that the film’s bad guy, Anthony Hayes’ Warren, seems to throw back to every prison bad guy stereotype also drags down the film a little as well and at the end of the day makes him less menacing than he should be. Another plus for the film however is the cast. The fact that smaller roles are filled by actors of the calibre of Tony Martin (Blood Brothers, Closed For Winter) and Robert Taylor (TV’S Mr & Mrs Murder & Longmire) gives a strong testament to how good this script is. Then there is Xavier Samuel and Mark Leonard Winter who put in credible performances, but they are outshone here by the leading men Hugo Weaving and Don Hany. Weaving puts in one of his relaxed-but-still-gripping performances while Hany delivers the performance that his legion of fans expected. Since his early days in White Collar Blue and his award-winning portrayal of Zane Malick in multicultural Police drama East West 101 the public has known that Don Hany would one day become a leading man that warrants feature film status. That certainly arrives with Healing which sees Hany play a character that is almost twenty years older than he actually is. To get into the role he ate junk food and started smoking, the result is a strong performance that should see him start to warrant overseas attention for his services. Healing is hardly the kind of film that is going to be lapped by the popcorn brigade, no this is more a film for those who love good cinema. 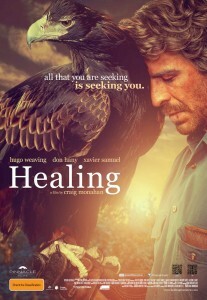 Heartfelt and warm Healing is the kind of film that will affect some emotionally. Other Subculture Media Reviews of ‘Healing′: Please check Dave’s Healing review that aired on First On Film on J-Air on the 4th May, 2014.